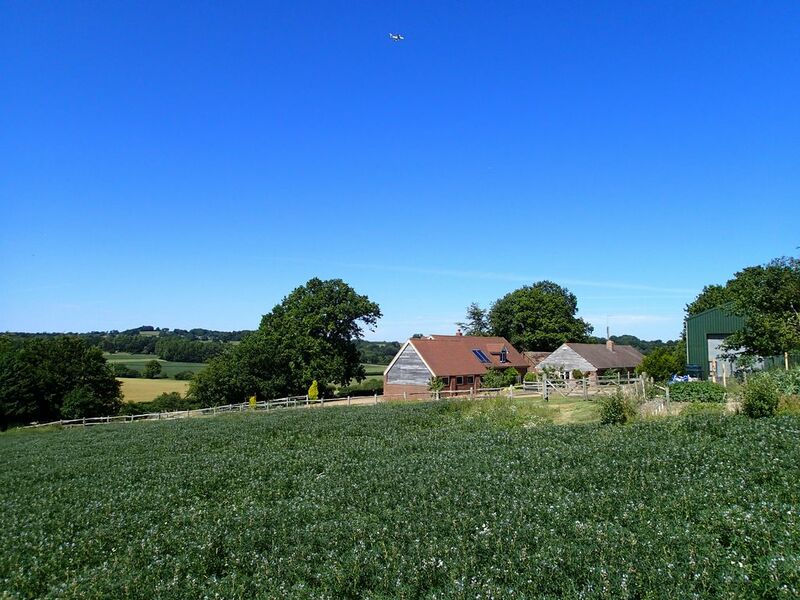 Kent View Cottage is single story brick and tiled building, converted into a luxury holiday cottage in 2012, with stunning views from every room over our own land across the valley into Kent on the other side of the county border. It provides comfortable accommodation for 4 people with two double bedrooms (one with a king-size bed and one with two doubles) both with under-floor heated, en-suite wetrooms. There is also a large sitting/dining room, including a fireplace with a wood burning stove, a kitchen with a breakfast area. Kentview is available to let by the week (fri-fri) on a fully inclusive basis. Little Saxbys Farm is approached from a private driveway well away from the main road. Both our cottages are former red brick and clay tiled farm buildings recently restored and converted to fully furnished holiday accommodation. Sussexside Stables offers two double bedrooms (one with a king-size bed and one with two doubles) both with en-suites. The cottage has all the comforts of modern day living plus a wood burning stove. Real oak furniture and flooring give the cottages a warm, comfortable and traditional feel, but it is really is the location that sets us apart. Hello, My name is Michael Evans. I am probably best known world-wide as a fly fisherman, having been a professional fly fishing instructor, writer, film-maker and commentator for some 27 years now. I live on the beautiful Kent Sussex borders near Cowden with my two Labrador Shimmer and my hens. The holiday cottages I rent out are adjacent to my house and if I am not away on one of my trips, I always greet my guests and try to look after you personally otherwise my caretaker is on hand to ensure your stay is as comfortable and enjoyable as possible. I am in the heart of the English Country-side at its most beautiful and yet London is very accessible. Fantastic location for Golf - see our website for all the major courses nearby. The cottage is sited in a fabulous location, on a quiet lane and with walks all around. There was no need to use the car at all. The place is really well equipped with everything you could need, although a few more plates and mugs would be handy. There is a lovely walk across fields to an excellent pub for lunch in Cowden. We stayed here when I did the Gauntlet triathlon at Hever Castle and it is an excellent base for that. Thank you Denise, more plates & mugs being sorted. Look forward to seeing you next year! We loved our stay in this "great" cottage. Spatious, clean, comfortable and modern (not to much clutter :) ) Very robust furniture of high quality. Quiet and calm environment of natural beauty. Well equipped : TV DVD internet ... Ecological heating system. Bullseye ! We, four adults, rented the Sussex Stable for a week in June. The cottage is a very nice converted stable where we had a wonderful time. The kitchen is well equipped with a washing machine and dishwasher. Both bedrooms have en-suite. The owner, Michael, is a kind man who helps you with all you want to know or do. The cottage is situated in a area where you can make very nice walks through the fields. Cowden has a railway station with good links to London, but also from nearby East Grinstead you can be in London in an hour. Around Cowden are nice towns such as Royal Tunbridge Wells, Tonbridge and East Grinstead. But also a lot of small villages, who are nice to visit. A must do is the Blue Bell railway, a steam train running from East Grinstead to Sheffield Park. Wij, vier volwassenen, hebben de Sussex Stable voor een week in juni gehuurd. De cottage is een zeer mooie omgebouwde stal waar we prima vakantie hebben gehad. De keuken is goed uitgerust met een wasmachine en vaatwasser. Beide kamers hebben een eigen badkamer. De eigenaar, Michael, is een zeer vriendelijke man die je helpt met alles wat je wilt weten of doen. De cottage ligt in een gebied waar je heel mooie wandelingen kunt maken door de velden. Cowden heeft een treinstation met goede verbindingen naar Londen, maar ook vanuit East Grinstead ben je in een uur in Londen. Rond Cowden zijn leuke stadjes zoals Royal Tunbridge Wells, Tonbridge en East Grinstead. Maar ook veel kleine dorpjes, die leuk zijn om te bezoeken. Een aanrader is Blue Bell Railway, een stoomtrein die rijdt van East Grinstead naar Sheffield Park. We rented the Sussexside cottage during the school term break, with my mother and my daughter, and had a wonderful stay. The stables have been beautifully converted with a better equipped kitchen & nicer bathrooms than our own at home. It was the perfect spot for walks in the Cowden countryside with refreshments at the local pub before heading back to a cosy evening in front of the fireplace. Michael is a gracious and very helpful host, who even helped us from the train station and back. We used a local taxi company for our one rainy day trip to Penshurst Place, which was lovely as well. Vi er en norsk familie som leide Kentview-hytten en uke i juli 2016, og som hadde et kjempefint opphold. Hytten ligger på et gårdstun i svært landlige og rolige omgivelser, typisk frodig Kent-landskap. Vi brukte hytten som et utgangspunkt for reiser rundt omkring i Kent, til London (ca 45-50 minutter med tog fra Cowden stasjon 5 minutters kjøretur unna) og andre deler av sør-England. Det er verdt å merke seg at denne hytten koster det samme for en hel uke som to-tre overnattinger på et ordinært hotell i London. Dette er uansett også veldig mye hyggeligere. Gårdbruker og hytteeier Michael Evans er dessuten en særdeles omgjengelig og hyggelig kar. Kan trygt anbefale dette stedet. Hilsen familie fra Asker. Use of a car strongly recommended. Nearest village shop 2 miles. For other things to do and places of interest see our website. Booking Notes: On-line booking and payment system on our website www.kentbordercottages.co.uk Changeover Day: Saturday Notes on prices: Short breaks available up to four weeks in advance. See website for details.